according to a new study by a group of scientists from the Canadian Wildlife Service, polar bears are under threat of starvation from climate change due to melting sea ice. This trend, they say, is due to a decline in the main food source of the bears -- ringed seals which live on the ice of Hudson Bay which are decreasing in number because of a shorter ice season. Ian Stirling, Nicholas J Lunn and John Iacozza, who conducted the study, based their findings on an earlier National Aeronautic and Space Administration (nasa) study which found a 2.9 per cent decline per decade in the total Arctic sea ice extent over the past 20 years. "We're wrong if we think that climate change is something that will happen far off in the future. Polar bears are starving now and we need to act now to stop climate change," said Kevin Jardine, a climate specialist with the environment pressure group Greenpeace. The study concluded that the sea ice season in the western Hudson Bay has been reduced by about three weeks over the same period. As a result of the reduction in sea ice, polar bears have less time to hunt and are returning to land in poorer condition, states the study. Although a significant population decline has not yet begun, this is inevitable if the trends continue, warns the study. Hudson Bay polar bears are unique because of their tendency to fast for six to eight months each year, depending heavily on hunting during the sea ice season for survival. 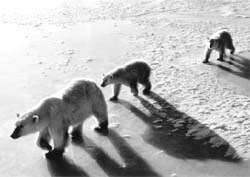 Since the Hudson Bay sea ice season is the shortest of all the regions of the Arctic Ocean, these bears are on the very verge of starvation. The Canadian study also says that there has been an increase in bear-human altercations as hungry polar bears wander into the northern Canadian community of Churchill, Manitoba. "Starving polar bears, Asian floods and dying coral reefs are all major climate danger signals," said Jardine. "World governments must begin urgent negotiations to cut global greenhouse gas emissions by more than 50 per cent and begin the phase-out of fossil fuels such as coal, oil and natural gas," he said. Says Harvey Lemelin, the executive director of the Churchill Northern Study Center: "If this trend continues, there will be no polar bears left."